View More In Media Organizers. 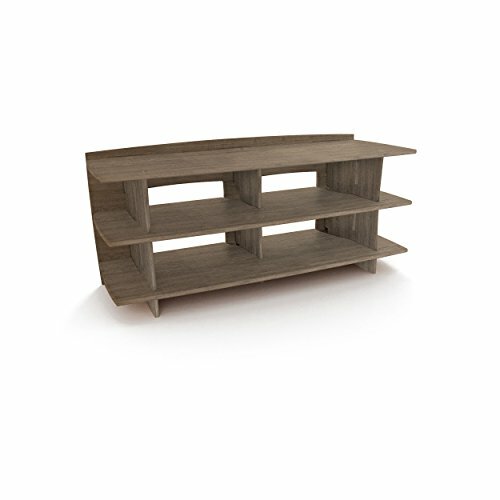 Clean, minimal design suitable for any home, the Legare Media Stand is the perfect piece to house and display your TV and media components. With two 8-inch high bays and a top surface that can fit a 42-inch or 58-inch TV, this media stand refuses to skimp on storage space. There's even four outer shelves for speakers, Blu-ray disks, or DVDs. To avoid messy wire clutter, this piece features convenient cable management openings. You'll be amazed at how easy this piece is to assemble; you won't even need to get out the tools! Dimensions: 38W x 18D x 24H in., holds a 42 inch tv. 53W x 20D x 24H in., holds a 58 inch tv. Choose from available sizes. Made of solid maso bamboo plywood. Finished in a neutral gray for any setting. Includes two 8-inch bays. Back panel openings for easy cord management. 4 open shelves for storage. Easy, tool-free design. Fits most TVs 42-58 in.. If you have any questions about this product by Legare, contact us by completing and submitting the form below. If you are looking for a specif part number, please include it with your message.